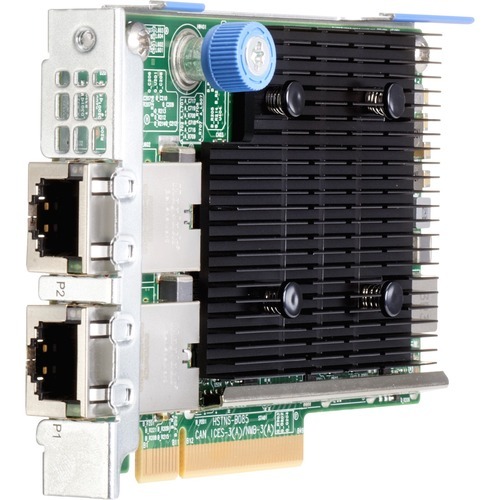 The HPE Ethernet 10GBase-T 2-port 535 adapters (include HPE Ethernet 10Gb 2-port 535FLR-T Adapter and HPE Ethernet 10Gb 2- port 535T Adapter) for ProLiant Gen10 rack and Apollo Servers feature Broadcom's BCM57416 Ethernet solution. These adapters have two RJ-45 connectors, deliver full line-rate performance across all ports with low power consumption, utilizing CAT 6A UTP (or better) cabling with distances up to 100 meters and is backward compatible to existing 1GBASE-T infrastructure. The 535 adapters offer a rich set of offload technologies including Tunnel Offload support for VXLAN, NVGRE, Geneve network virtualization that increase virtualization performance. The HPE Ethernet 535 adapters can provide up to 40Gbps of bi-directional Ethernet bandwidth, helping to alleviate network bottlenecks.